In 2017, millennials finally entered the housing market in force, comprising 71 percent of first-time buyers and 42 percent of all buyers who purchased a home in the last year. Despite driving much of buyer demand and activity, this group of 18- to 37-year-olds still faces a number of roadblocks on their way to homeownership — namely student loan debt and rising home prices. According to a recent study by Apartment List, since 1980 the median home value has jumped by 60 percent and the average cost of undergraduate tuition has grown by 160 percent. Meanwhile, wages have only grown by 25 percent, leaving millennials to struggle with juggling inadequate income, ballooning student loan debt and skyrocketing home prices. Recent college graduates have an average of $34,000 of debt — a 70 percent increase from 2005. But on average, these graduates are only making 57 percent more than those with a high school degree. 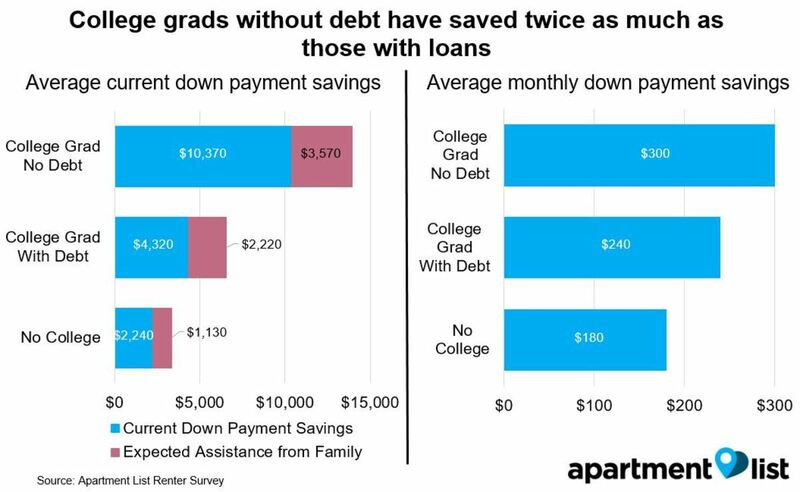 On average, and taking into account expected down payment assistance from family, recent college graduates (those surveyed were renters between the ages of 22 and 35) with student debt are managing to save $6,500 toward a down payment on a home — double the amount of high school grads ($3,400) and half the amount of college graduates with no debt ($13,900). 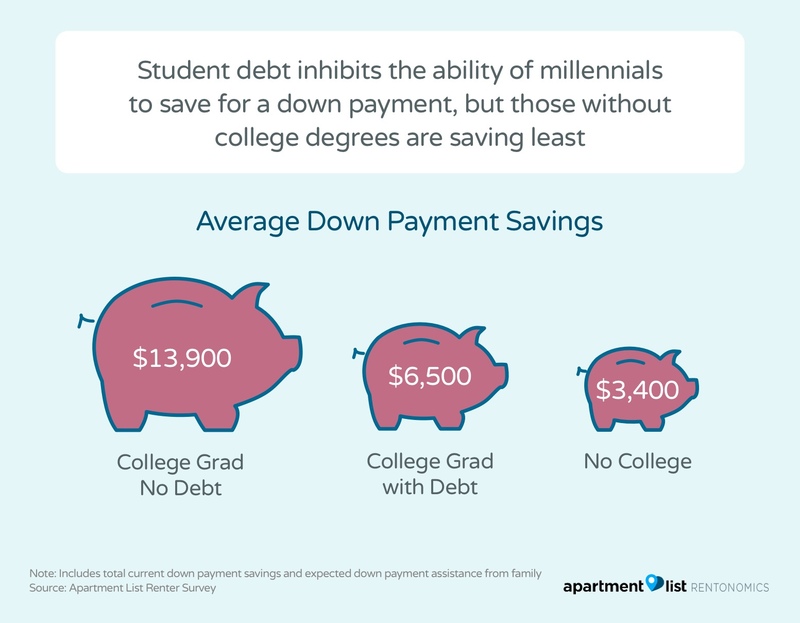 At that rate of saving, Apartment List found it will take college graduates with no debt 7.9 years to save a 20-percent down payment for a median-priced condo. For college graduates with debt and those without a college degree, it will take 11.9 and 16.7 years to save, respectively. “In other words, a 25-year-old who did not attend college would not have enough saved for a down payment until she is 42; assuming a 30-year mortgage, she would be paying off her home loan into her 70s,” the report noted. Apartment List says saving for a down payment in an expensive city could take more than 20 years for someone without a college education. But it’s important to note that: 1) those numbers change based on the median home values in any given metro area, and 2) the requirement of a 20-percent down payment is thought of as a “myth” now, and numerous programs are available for people unable or unwilling to shell out that much cash up front. SmartAsset’s latest study drives this point home since no “big cities” made their top 10 list of cities with high millennial homeownership rates. In fact, the only city that came close was Las Vegas (no. 22) and New York City and Los Angeles were ranked 148 and 153 (out of 200), respectively. Most of the cities in the top 10 were in the South and Midwest, regions known for lower median home values and overall lower costs of living. In Olathe, Kansas, no. 1 on the list, half of millennials are homeowners — well above the national average of 34.7 percent. 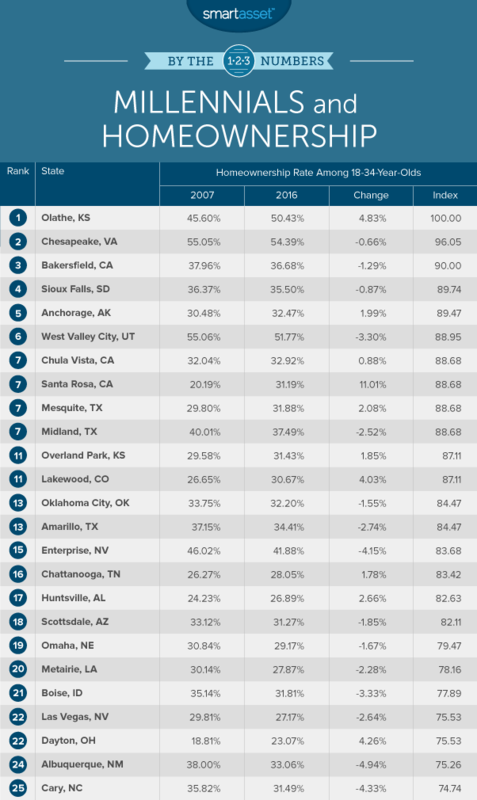 Chesapeake, Virginia has a 54.4 percent millennial homeownership rate, but came in at no. 2 due to the 0.6 percent year-over-year decrease. Bakersfield, California (36.7 percent); Sioux Falls, South Dakota (35 percent) and Anchorage, Alaska (32.5 percent) rounded out the top five. SmartAsset notes that millennials can circumvent the long down payment savings process by taking advantage of 3.5 percent FHA loans and first-time buyers programs that many states offer. Apartment List: Responses to the Apartment List Renter Survey were collected from October 2016 to December 2017. Responses reflected here are limited to millennial renters between the ages of 22 and 35, with current students excluded. Average down payment savings and estimated years needed to save a 20 percent down payment are based on data from only those respondents who stated that they plan to purchase a home in the future. Survey responses to questions on down payment savings are stated in ranges (e.g. “$100 to $199”). Point estimates are taken as the midpoint of the range, and the reported aggregate figures represent a straight average of these midpoints. As a proxy for starter home prices, we use data on median condo prices from the National Association of Realtors. We estimate the number of years needed to save 20 percent of that price based on current saving levels and monthly saving rates. SmartAsset: In order to find the cities where millennials are buying homes, SmartAsset looked at data for the 200 largest cities in the U.S. Specifically, we looked at the following two metrics: the 2016 millennial homeownership rate and the 10-year change in Millennial homeownership rate. First, we ranked each city in each metric. Then we found each city’s average ranking giving equal weighting to both metrics. Using this average ranking we created our final score. The city with the best average ranking received a score of 100. The city with the worst average ranking received a score of 0.